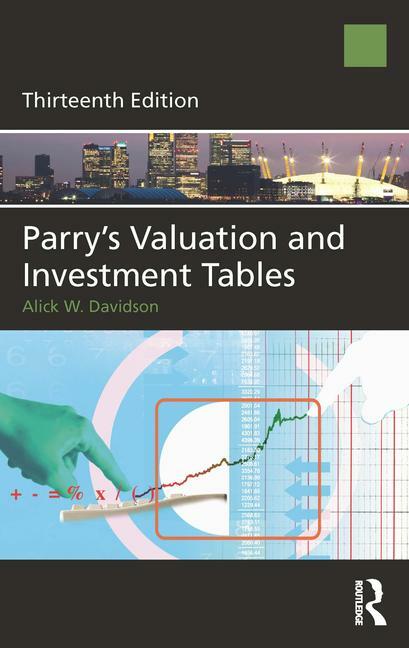 First published in 1913, Richard Parry’s Valuation and Investment Tables has since become an essential tool for students and professionals in the study and practice of valuation and appraisal. The book provides a comprehensive set of some 30 different valuation and investment tables in one volume. In practice today, calculations are required for a variety of purposes which often justify more than one approach. With this in mind, Internal Rates of Return tables have been retained in a modified form. Using these tables, both growth and non-growth scenarios can be analysed for a more detailed appraisal of specific freehold property investments and to provide a basis for more in-depth investment advice. The Life Tables have been removed and replaced with a guide to calculating life interests from up to date census data. Although the tables will be used mainly by students and practising surveyors, they will also be useful to accountants and others concerned with various types of investment and financial calculations. That the book has reached its centenary year and thirteenth edition is a testament to its acclaim by the valuation and property professions in an era of calculators, smartphones and sophisticated spread sheet software and furthermore a tribute to the historical importance of Parry’s original vision and continued legacy. In celebration of this milestone year there will be a limited edition leather slip cased version of the book available.